Fear of Juror Backlash: If jurors looks you up mid-trial, even though they shouldn’t, you have to make sure that they are not put-off by the content. Biography is where we must start because the first thing any potential client will want to know is if the lawyer is the right one. The who, what, where and when of your professional life must be out there for the potential client to examine and, hopefully, be impressed. And that’s the hard part, impressing the potential client. Because most of us were not brought up to brag. We’re taught as kids to be modest. Yet on the website we must do the opposite by showing past results and clucking about ourselves, and this does not come naturally. Except, perhaps, if you are Gloria Allred. This wasn’t a problem in “the old days,” meaning before 1999 when I created my first site. I submitted verdicts and settlements to the New York Jury Verdict Reporter, which printed them up. Then I handed those printouts to clients so that they knew what kinds of cases I had successfully handled. In the digital age when information is demanded immediately, however, there is the need to put this stuff up on the web out of concern that the potential client will move on to another firm. Search Engine Optimization. What good is a website if no one finds it? Well, it’s only good if they already know your name. But if people are perusing a practice area without already having an attorney’s name, then you must do something to jump to the head of Google’s search results. And part of optimizing the website for search engines is the requirement that certain keywords be repeated over and over until the copy makes you puke. This is, once again, unnatural. Seeing the same phrases gratuitously repeated destroys any decent writing that you may have done. This means that while you wrote the site for a client to find you, now that they have found you they will see that your writing leaves much to be desired. Fear of Juror Backlash: Yes, we have to keep jurors in mind when creating a website because no matter how many times a judge tells jurors not to look you have to assume it will happen anyway. And here is the catch: What might look like a decent website in the eyes of the potential client (showing a track record of success) may look like obnoxious braggadocio to a juror. Worse yet, it will look like poorly written obnoxious braggadocio due to the need for the search engine optimization. Thus, years of work getting to trial may now be impeded if a juror believes their verdict will be just some notch on a lawyer’s gun belt. We live in an era where we occasionally see wretched lawyer ads — and now solicitation by website or blogs. While such lawyers are few and far between, their antics may get broadcast widely in the electronic age, and it sends a powerfully negative message to the public. Those horrid ads, as well as the occasional loopy lawsuit that finds its way to Overlawyered or the local papers where they are often justifiably skewered, helps to create and feed a deep cynicism when it comes to attorneys. Of course, if a lawsuit makes the papers that means it was the exception and not the rule, since plain vanilla cases aren’t of interest to the media. But we must still deal with this anyway when picking jurors since those ads or crazy cases were the impression left on the jury pool. Only a fool would believe it doesn’t have an effect. So the juxtaposition of these three elements — clients, search engine optimization and jurors — creates an unsolvable riddle for me. One possibility is to create a 2nd website, and have that swapped out with my real one when I am on trial so that jurors are not offended. But that doesn’t take care of the conflict between potential clients (where good writing is beneficial) and SEO (where poor writing is beneficial). I’d like to end by saying that I’ve have solved this riddle. But I haven’t. Nor have I seen any other personal injury website solve it, even those written by “professionals.” Many of us do the same thing when it comes to our content, repeating the keywords for Google, listing past results and hoping that we can find a happy middle ground. Many of the sites appear to be oblivious to the potential for juror backlash. If anyone does know the magic bullet — and it seems to me that this is a job for a copy editor not a marketer — I’d love to hear about it in the comments or on your own site. It must exist in some form. I’d also add that this is not a request for marketer solicitations, but a public discussion on how the competing issues can be reconciled so that those attorneys whose sites appeal to consumers (personal injury, criminal defense, divorce, residential real estate, etc.) can be informative, dignified and easy to find amongst the clutter of the web. I think the blog is a great start. If you Google “new york personal injury lawyer” the first site is your blog and not your static website. In your case, you can probably minimize any SEO efforts on the static site and let the blog be the first landing page that gets the clients’ attention. Then they can click through to your website and its wonderful, SEO-free copy. That’s an interesting thought. I suppose I could strip much of the SEO out of my website, and hope that content from my blog simply makes me visible. That could result in a better written website, but one that appears deep down out of direct view. I’m impressed that you managed to write an article discussing PI websites and SEO without littering the article with SEO friendly PI terms. If you keep this up you may just give lawyer advertising a good name. I couldn’t resist googling NY PI Lawyer myself, congrats on the 1st google rank, that is a well deserved placement! I’m impressed that you managed to write an article discussing PI websites and SEO without littering the article with SEO friendly PI terms. Well, writing the blog post was easy. As long as you focus on writing for humans instead of computers you can do what comes naturally. The big problem is the SEO for the computers that gets used on the websites. As an attorney who is also a part-time web designer, I respectfully disagree that SEO requires you to gum up your writing with monotonous overuse of keywords and key phrases. That ain’t the way to get your page closer to the top of the search results. Click on the link inside the yellow box for a PDF explaining basic best practices for SEO. As far as “bragging” goes, I feel like you can convey an appropriate air of professionalism and competence by appropriate use of design aesthetic. The look and feel of your site is very important. For example, take a luck at Cravath’s site. Simple, minimal design that oozes class. That site ain’t from a template. It’s a site built by hand by someone with training in the fundamentals of graphic design. And it shows. With respect to Cravath (and other BigLaw firms) though, they don’t have a consumer orientation, where folks who don’t know a lawyer are in need. So they can afford to be more lean in their approach with respect to past results. A small practitioner, who the potential client has never heard of before, doesn’t have that luxury. Both my website and blog, by the way, had the hand of a graphic designer. Whether it is good or not is a separate issue, and subject to taste. I will check out the Google link you provided, and hopefully figure out a way to tinker a bit with my copy. You can always rephrase or edit your articles or contents retaining necessary keywords valuable for SEO purposes. Actually, I think I will kill off some of the SEO and just try to make it read better. Perhaps I should just trust that Google won’t kill me for it. We’ll see. Just don’t be the guy who writes “If you too have driven an SUV into a swimming pool.”Honestly, while I don’t know what you’ve been told about SEO, the most important thing is links from other sites, not keywords. 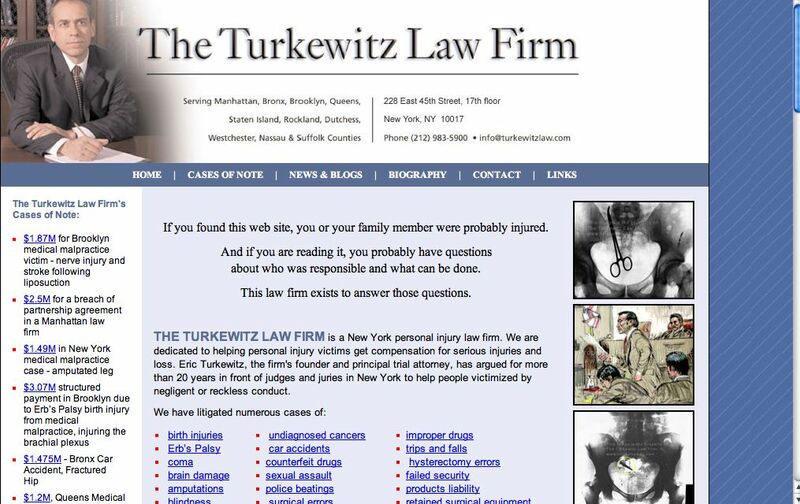 You write a great blog about New York personal injury law (which along with your name are only keywords you need) and it gets you links from other sites, deservedly so. The link from your “elephant” blog to your “gazelle” firm site should be enough. I understand you have to keep the blog separate from the personal site to avoid anti-solicitation rules (and thank you for it, as we found your Buffalo crash posts quite informative on attorney ethics), but I’d be astonished if you don’t draw the bulk of your web traffic from this well-written blog. I loved that SUV/swimming pool thing. I almost fell off my couch when I read it, and you know how hard it is to fall off a couch. Thanks much for the compliments. The blog is easy compared to the website. On the blog I don’t have to talk about myself.